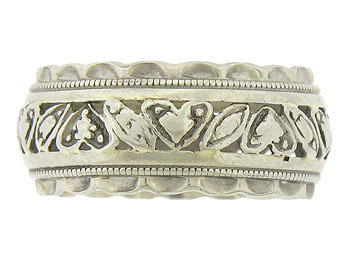 This antique wedding band features layers of decoration. 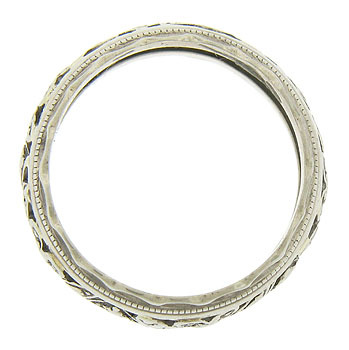 A central ribbon of organic cutwork spins across the band, while simple stripes of polished white gold, strings of milgrain and finally impressed scalloped bands complete this spectacular ring. 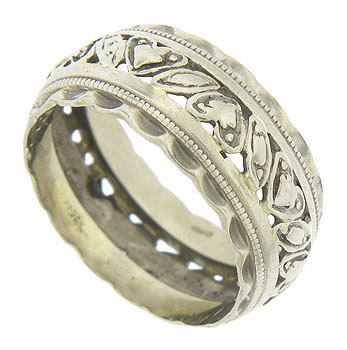 The Art Nouveau wedding ring is fashioned of 14K white gold and measures 8.28 mm in width. Circa: 1915. Size 6 1/2. We cannot re-size.